Having my sons and Andy's mum over for Christmas has meant lots of cooking ! So its nice to get out into the fresh air for a walk, even if the weather was bracing. One of my sons, Andy myself and the dogs headed to the beach. We wrapped up well as the wind whipped at our faces. Rannoch and Sparky enjoying every minute. 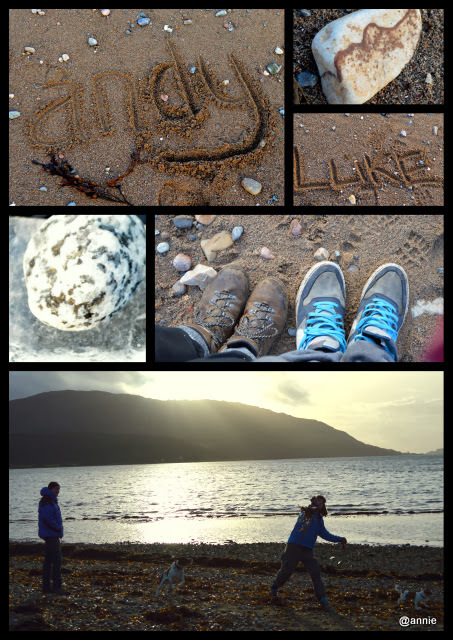 I collected some pebbles and sea glass, of course Luke and I wrote all our names in the sand. puddings, roast potatoes vegetables and onion gravy. We had another walk on a beach yesterday but luckily it wasn't as cold as it is with you! I'd give anything for a beach walk - but we're 2.5 hours from the coast and driving down means at least an overnight to make it worthwhile. Perhaps after New Year's Eve we'll take a little trip. Love the pics Annie - I like taking feet shots too! Happy day - well night I guess as it's much later there! We walked on the beach yesterday morning and then along the South West Coastal Path just before sunset and then home for dinner. We sat on the cliff edge and watched the Fulmars flying in front of us enjoying the wind under their wings. I imagine our ocean and air temps are a bit different than yours. We are headed out right now to walk The Tasmanian Devil (Lulu) on the beach. Yes Carol I am sure they are, our air temp is 37 F and sea temp is 48 F enjoy your beach walk in what I assume is about 63 F ?